10 Ways To Save $10,000 This Year! 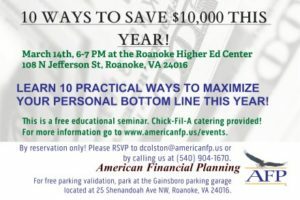 March 14th, 6-7 PM at the Roanoke Higher Ed Center, 108 N Jefferson St. Roanoke, VA 24016. This is a free educational seminar. Chick-Fil-A catering provided. By reservation only. Please RSVP today! For free parking validation, park at the Gainsboro parking garage located at 25 Shenandoah Ave. NW, Roanoke, VA 24016.